Store and dry pans with ease with this Lakeside 848 stainless steel sheet pan drying rack! 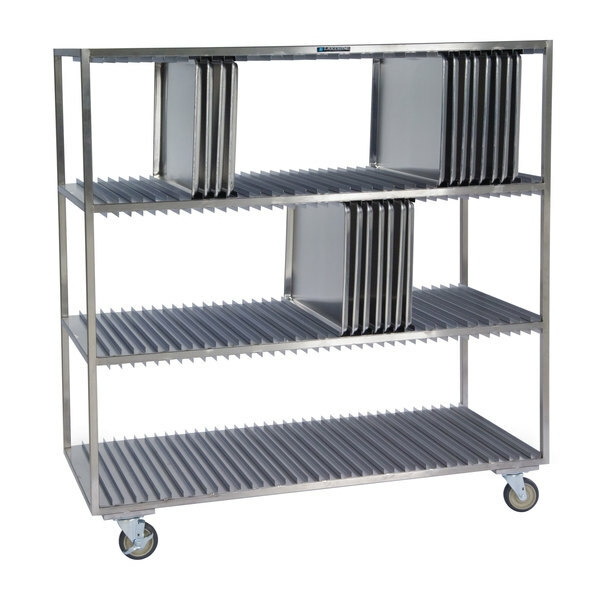 Great for high-volume food service facilities, this rack can hold up to (120) 18" x 26" or 14" x 18" pans or trays. This rack has an all-welded frame of stainless steel square tubing for durability through frequent use. The stainless steel channel sides with 1 1/2" spacing and solid stainless steel tray shelves ensure strength and stability while being easy to clean and sanitize. A pan-stop ledge keeps pans in place and prevents them from sliding around or falling off the rack. This open rack makes a smart addition to your facility. With the help of its 5" all-swivel, no-mark, polyurethane casters (2 with brakes), you can use this mobile rack to transport pans straight from sinks to storage areas! It also features heavy-duty 14-gauge caster mount gussets. Built to last, this rack is just what you need for fast and efficient drying of sheet pans!